Q: When does the lottery launch? 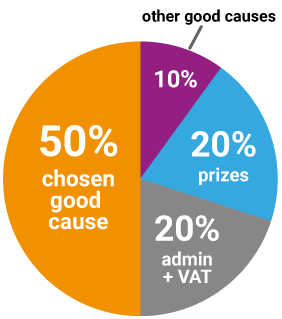 A: The lottery is now open to causes and supporters with a first draw on Sat 4 May 2019! A: We’ll need some key pieces of information to get you registered as a good cause on the Rugby Lotto. This will include your organisation's name, key contact and role, address, telephone number and email. We will then need you to confirm your eligibility (see question above). A: We provide your good cause with its own tailored communication materials. These will be professionally prepared PDFs which can be attached to e-mails that are sent out to your community. Our materials can also be printed and posted around the local area. We also provide you with your own dedicated webpages on the www.rugbylotto.org website for your supporters to sign up, check results and see how much money is being raised. A: We do! We have a dedicated support number (01788 703010) that deals directly with any queries your supporters have as well as our support email address ([email protected]). A: Yes. Players can call the dedicated Rugby Lotto number – (01788 703010) – to register and set up payments. A: None! All you need to do is shout about your Rugby Lotto page! A: 10p is used to support other good causes within Rugby. 20p goes to prizes and the remaining 20p is for administration of the lottery and VAT.